Distance: 4 miles from the parking lot to the summit plateau. Vertical elevation change is about 3700 feet and starts at about 700 feet. The route meanders through several different ecosystems as temperatures and average rainfall vary with elevation. The hike begins at the Mount Si Natural Resources Conservation Area parking lot. It climbs from a low-elevation conifer forest to the vestiges of an old burn, now becoming a new forest of firs. The fire dates back to 1910 when Mount Si burned for weeks. At 1,600 feet (about a mile) you come to an obvious stopping place, a rocky area with a view to the valley and Interstate 90. Another obvious rest stop is reached at about 1,750 feet with benches. Snag Flats is reached in another 3/4 mile at about 2,100 feet, the only level section of trail you’ll encounter. Just before Snag Flats, a short path descends to a stream, a cool place to rest on a hot day. It is about 2 1/2 more miles to Haystack Basin at about 3,900 feet (four miles total). There are plenty of good rocky perches and benches below the Haystack. From the base of the Haystack there are views more than 3,000 feet straight down to the valley and I-90, as well as out to the Olympic Mountains and Seattle. 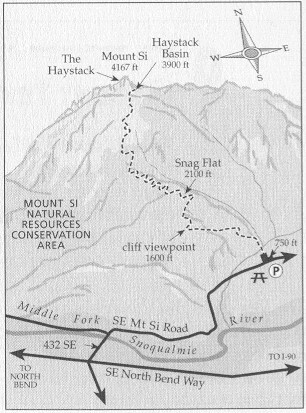 The Haystack is a short scramble from there, and is moderate class 2/3. In the winter it can be a good mixed/ice climb.